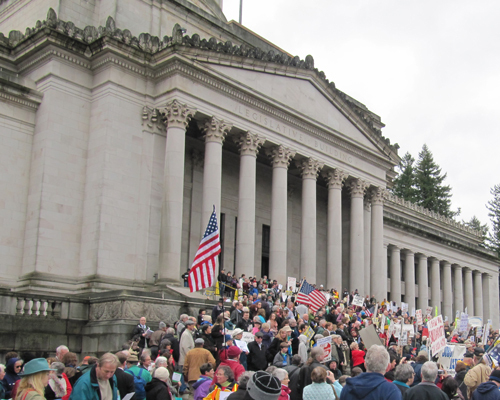 The Church Council of Greater Seattle, as an organization rooted in communities of faith, urges robust action toward the meeting of human need as the State Legislature convenes this year. We believe that a “sufficient, sustainable livelihood for all” should be the goal to which we strive for all of God’s people. In addition to our ongoing commitments to end homelessness, create low-income housing, protect human services and promote a shared prosperity, the Church Council will examine and take positions on a case-by-case basis for measures that advance: climate justice, immigration and criminal justice reform, equitable and just taxation, and mental health services. On these measures and our priorities noted above, we will seek to use a critical racial justice lens as a means to enhance equity in our communities. Advocating for funding opportunities to provide for a quality mental health care system. Support revenue increases towards a “sufficient, sustainable livelihood for all,” including meeting the basic needs of our state’s residents. Investments in the Housing Trust Fund happen through the Capital Budget process and the funds are allocated on a competitive basis to build and preserve affordable homes. Homes built by the Housing Trust Fund remain affordable for at least 40 years, and provide homes for families, seniors, veterans, immigrants, people with disabilities, farmworkers, and more. $200 million in the Housing Trust Fund will help create more than 5,700 newly affordable homes. TANF (Temporary Assistance for Needy Families) helps struggling families with children by providing limited cash assistance and support in finding employment. TANF is used by families for rent, utilities, groceries, and toiletries. Today’s grant is historically low; grant levels in 1996 were $250/month more than today. The maximum cash grant for a family of 3 is $521. In 2000, TANF covered rent in most places; today’s rents are more than double the amount of the maximum grant. The Housing and Essential Needs (HEN) program ensures that people diagnosed with significant but temporary mental illnesses or physical disabilities can meet their basic needs while unable to work. The program provides rental, utility, and transportation assistance, as well as access to health and hygiene items. The Aged, Blind, and Disabled (ABD) program helps extremely low-income adults with permanent mental health illnesses or physical disabilities by providing modest cash assistance of up to $197 per month while they apply to the federal Supplemental Security Income program. When people transition to SSI, the federal government reimburses the state for the full cost of the ABD cash grant. ABD also provides support to low-income elderly and disabled documented immigrants who are not yet eligible for federal medicaid and income support benefits. Medical Care Services provide health care coverage for elderly or disabled immigrants who have legally verified immigration status. Banning source of income discrimination improves access to housing by preventing landlords from denying tenancy based solely on the grounds that a tenant relies on a subsidy or unearned income (such as Social Security Disability Insurance or Section 8) to pay all or a portion of their rent. Stable and affordable housing is the platform for families and individuals to thrive in a community. Using subsidies in the private rental market is a critical component to making homelessness rare, brief and one-time. A modest fee paid to file real estate related documents provides Washington’s most significant source of funds to combat homelessness. The fees fund critical resources like domestic violence shelters, youth shelters, outreach services, short- and long-term rental assistance, move-in assistance, permanent supportive housing services, and more. Expand housing for people with disabilities experiencing long term homelessness. Ensure full Operating Budget authority for our state’s Medicaid Transformation Demonstration to fund services in permanent supportive housing. Even in this modern day, many workers are denied the wages they are owed for work they have provided. Addressing wage theft will put millions of dollars back into our economy, improve the fiscal health of our local communities, and put wages back in the hands of working families across the state. The State of Washington is responsible for ensuring that jobs and contracts emanating from the state Departments of Transportation and Commerce include minority workers, businesses and contractors. Concrete actions that result in justice and equity for minority workers, especially the African American community and businesses, as reflected in the budgets and oversight of the Departments of Transportation and Commerce, are needed in this biennial cycle so that the whole community is served. Paid family and medical leave would allow workers to take extended paid leave for their own health condition, or to take care of a family member, by creating a modest payroll premium that’s shared by employees and business owners – around $2 a week for each. Federal policy provides only 12 weeks of unpaid leave for a new baby or the serious health condition of a worker or family member, but almost half of all employees aren’t covered. The death penalty is costly, does not provide swift and certain justice, does not deter crime, and is not applied evenly or fairly. Replace the death penalty with a life sentence that includes a work requirement so restitution can go to victims’ families and no possibility of parole. Under the Fair Chance Act, criminal history background checks could not be used as an initial screening tool except for jobs requiring unsupervised contact with vulnerable adults or children, in the financial industry, and in law enforcement. The Act does not interfere with Federal requirements for background checks or with the employer’s right to ask questions about past convictions in a job interview. Commonly referred to as “Ban the Box,” this act would increase public safety, reduce government spending and help people become productive members of society by increasing job opportunities for those who have been arrested or convicted of a crime. The current LFO system imposes crushing debt burdens that are unfair and impossible to pay for many of those who want to pay. The Church Council supports prioritizing both the collection and payment of restitution to victims and the support of successful reentry of individuals coming out of the criminal justice system. Eliminating the current 12% interest rate during and shortly after incarceration is one of a number of positive steps that can be taken which will reduce disproportionality in the system and provide meaningful alternatives to ensure that no Washington resident is jailed for being poor. The Department of Corrections may offer postsecondary degree opportunities within current funding. Research has demonstrated the benefits of educating inmates, 97% of who are eventually released back into our communities. Creation of an independent Correction Ombuds office would promote transparency and accountability in the administration of the state’s correctional system through the creation of an independent oversight entity. Early investigation and unbiased, objective intervention in issues arising in our correctional system reduces conflict and promotes cooperation and collaborative problem solving, thereby avoiding costly litigation at taxpayer expense. Washington State is a mandatory sentencing state since 1984. In 2014, HB 5064 passed, providing the ability for people who were charged prior to their 18th birthday to be reviewed by the Indeterminate Sentence Review Board (ISRB). There may be an additional proposal that allows persons incarcerated 15+ years to be eligible to petition for parole, with such petitions reviewed by an Indeterminate Sentence Review Board or Sentencing Court. In 2014, the legislature said “the primary goal of the Washington state juvenile justice system is the rehabilitation and reintegration of former juvenile offenders.” RCS 13.50.010. Yet the Juvenile Justice Act does not specifically state rehabilitation as its purpose. Strengthening Opportunities and Rehabilitation for Juvenile Offenders (SOAR) makes “rehabilitation” an expressed intent of the Juvenile Justice Act; ensures deferred dispositions are available for qualifying youth; gives judges discretion to impose penalties on certain first offenses; creates a greater role for parents in domestic violence incidents when they are victims and increases prosecutorial discretion in these cases; and eliminates unnecessary notifications to the Department of Licensing and loss of drivers’ license for offenses that do not involve vehicles. As the Seattle Times said in “Shielded by the Law” (9/26/15), Washington state law is “the nation’s most restrictive law on holding officers accountable for the unjustified use of deadly force.” Only Washington law provides a defense against prosecution when a police officer acts “without malice and with a good faith belief that such act is justifiable.” Malice is defined in law as “evil intent.” To promote effective policing and preserve public trust, we must be able to hold officers accountable for irresponsible behavior. Gun safety legislation includes limiting access to assault-style weapons. Attorney General Bob Ferguson submitted an agency request legislation to ban assault weapons, specifically semiautomatic weapons with military-style features that render them more easily concealable or more deadly, and high-capacity magazines, currently unlimited under Washington law down to a maximum of 10 rounds of ammunition. The Washington Voting Rights Act is a bill to help ensure that every voter has an equal opportunity to elect the candidate of his or her choice. In some jurisdictions, outdated election systems prevent all neighborhoods and communities from being represented. The Washington Voting Rights Act empowers local governments to take the lead in fixing this problem with tailored solutions to fit that jurisdiction, as well as a roadmap, data, and timetables to avoid litigation. This helps ensure fairness in local elections. We anticipate legislation similar to the Family Unity Act proposed in 2015. That act would have responded to the issue of local police detaining non-citizens for immigration officials after they are due to be released. Between 2012 and 2014, Washington state assisted in the issuance of 10,853 U.S. Immigration and Customs Enforcement (ICE) detainers. The majority of these detainers were imposed on individuals who were either never convicted of a crime or who had merely committed minor offenses such as traffic violations. This collaboration between local law enforcement agencies and immigration agents from ICE can compromise community safety, use up scarce resources, and interfere with the rights of immigrants in their custody. The Family Unity Act would have prohibited local sheriffs and police from using their resources to enforce federal policies.